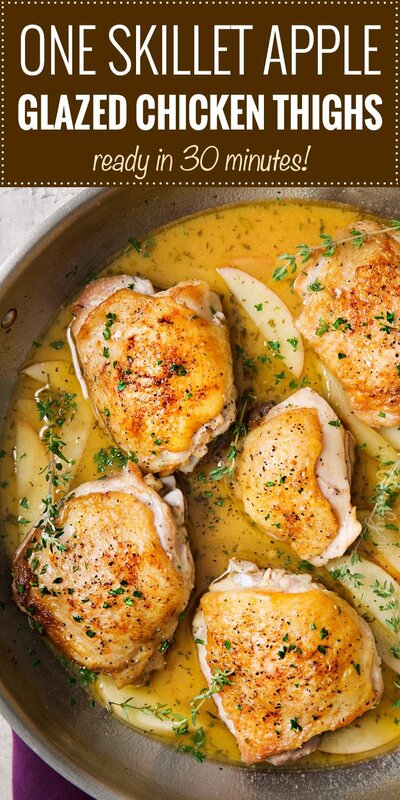 Juicy chicken thighs are seared with a crispy skin, then cooked with apples and herbs… all in one pan, and in 30 minutes! The perfect Fall meal… crispy, yet juicy chicken thighs bathed in a sweet and herby sauce, all cooked in one pan, and ready in 30 minutes! What could be better?! How’ve your weeknights been going? Are they hectic? Oh man, mine have been CRAZY! It’s nuts, because we only have one kid old enough to be involved in extra curricular activities, yet somehow, things are always so busy. Between homework, going to pick up my son, making sure my daughter gets her reading time in, and her karate, dinner is always a fly by the seat of my pants situation. And it’s embarrassing, because I cook for a living lol. But honestly, that’s where I love all these one pan dinners I’ve been cooking up for you all here on the blog! I know I can whip one them up in no time, and with minimal dishes to wash! Score!! 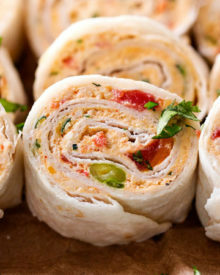 CAN I MAKE THIS RECIPE WITH CHICKEN BREASTS? Yep! I fully appreciate that not everyone digs the bone-in, skin-on chicken thighs, so I made sure this recipe will work with other cuts of chicken as well. 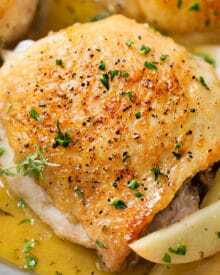 You can use boneless skinless chicken thighs or boneless skinless chicken thighs, just adjust the cooking time, depending on the size of your breasts/thighs. To be safe, use a meat thermometer, and watch for the chicken to get to 165 F degrees. OKAY, BUT WHAT ABOUT THE OTHER WHITE MEAT? Pork is a GREAT substitute here… because pork and apples go together perfectly! I would use boneless pork chops about an inch thick. 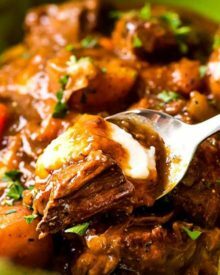 If you love pork and apples, you should check this other one pot meal out! The next time you’re panicking about getting dinner on the table, give these one pan apple glazed chicken thighs a try! You’ll love the Fall flavors, plus the easy meal! Stainless steel pan – This is rapidly becoming my new go-to pan! Tongs – Makes turning the chicken easy! WANT TO TRY THESE APPLE GLAZED CHICKEN THIGHS? 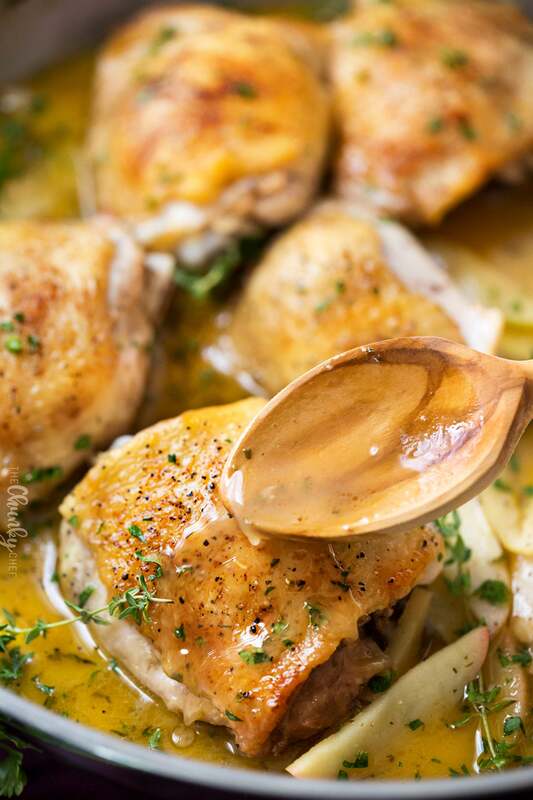 Juicy chicken thighs are seared with a crispy skin, then cooked with apples and herbs... all in one pan, and in 30 minutes! Pat chicken dry and sprinkle with salt, black pepper, onion powder, garlic powder and paprika, on both sides. To a large pan or skillet, add olive oil and heat over MED-HIGH heat until oil is shimmering. Add chicken thighs, skin side down, and cook 4-5 minutes per side, until golden brown. Remove to a plate. If your pan isn't large enough, the browning can be done in batches. Add apple juice and minced thyme to pan, using a wooden spoon to loosen the browned bits on the bottom of the pan. Bring to a boil, and cook until liquid has reduced by half, a minute or two. 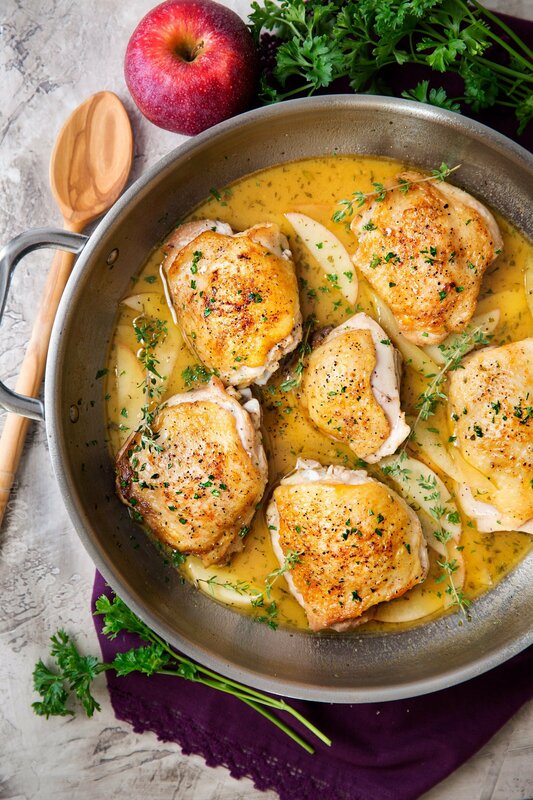 Add chicken back to the pan, scatter apples around the chicken, cover with lid, or aluminum foil, and cook over MED heat for 3-4 minutes. Spoon a little of the sauce over the chicken and serve. If you'd like the sauce to be a little thicker, remove chicken from pan, add 1 Tbsp cornstarch and 1 Tbsp water to a small dish, whisk to combine, then pour into pan and stir until all combined. Cook a minute or two, stirring often, and return chicken to pan after sauce is thickened. 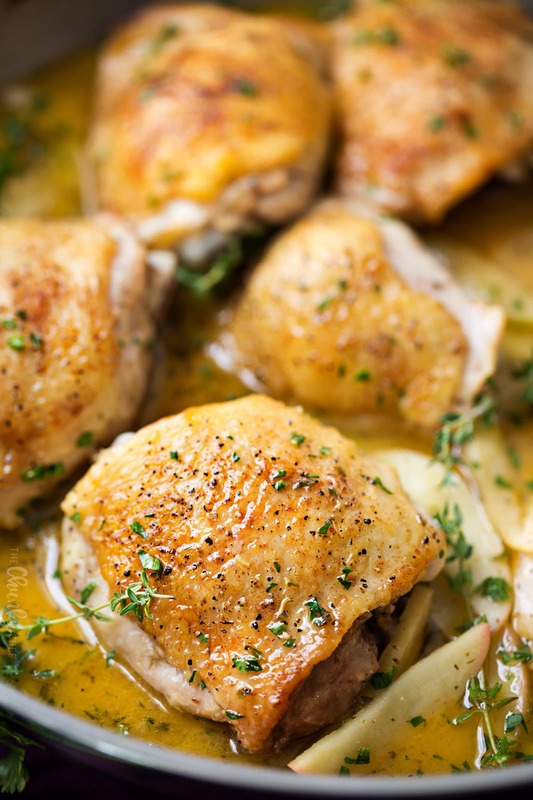 Boneless skinless chicken breasts or thighs can be substituted. Adjust cooking times as needed. 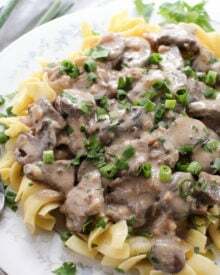 So I used this recipe in my Instant Pot and set it to high pressure for 10 minutes and it was so delicious! It was so full of flavor and super moist! We are definitely making it again soon! So I’m a noobie cook. This was a relatively easy recipe though…word to the other cooks who might be a bit inexperienced…make sure the oil has been removed from the heat and allowed to cool a bit before dumping a cup of apple juice in it. It will end badly. Thankfully I just dripped a tiny bit in. I heard Steve Irwin in my head say “Oh! The oil is angry!” Anyways the chicken came out delicious! What is the carb count per serving on this dish? One Pan meals are the best! They are even better when they look this good! Heck yes….these look awesome! I love the apple glaze! I am always up for one pan meals! Yum! I’m always looking for new chicken recipes, and this sounds wonderful! I can’t tell you how much I love one-pan meals! This sounds (and looks) so great! I’m sooooo tired of what seems like the 3 ways I always make chicken! This has me inspired! Aaaaand now I know what I want for dinner! This chicken looks AMAZING! This chicken looks so perfect for dinner!! !